At the mid-point each month, I look forward to getting our energy bill to see if any of our energy-saving measures are starting to pay off. So far, I’ve only seen small improvements. This month, however, the improvements are noticeable. I’ve received feedback from readers who are much more knowledgeable in energy use reduction than I am that looking at month-over-month changes is not nearly as telling as looking at year-over-year changes, since usage patterns vary considerably based on seasonal factors. 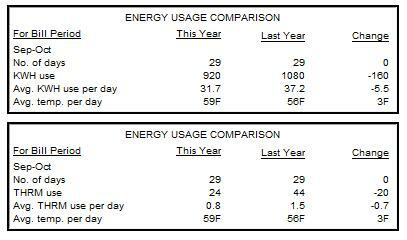 Looking year over year, our electricity usage is down by 15% and our gas usage is down by 45%. Since our furnace is by far our biggest user of natural gas, I credit reprogramming our thermostat and keeping the temperature at 68% as being the reason behind the improvements. I do think we can squeeze out a bit more efficiency by continuing to optimize the thermostat programming, primarily with trying to move the “away” temperature down more to see if we can do so without causing any problems. In spite of these improvements, it is clear we have a long way to go in improving our electricity usage. Our current usage, 920 KWHs a month is still pretty high considering that we are actively working to bring this down. Although a bit dated, here’s some really useful data about KWH usage, based on geographical region. In other news, I am sad to report that we’ve lost a chicken. A few mornings ago I realized that there were only five chickens in the coop/run. I looked all around but didn’t see the sixth chicken. We’ve been letting them free range a bit during the day and I think the chicken jumped over the fence and couldn’t get back in. 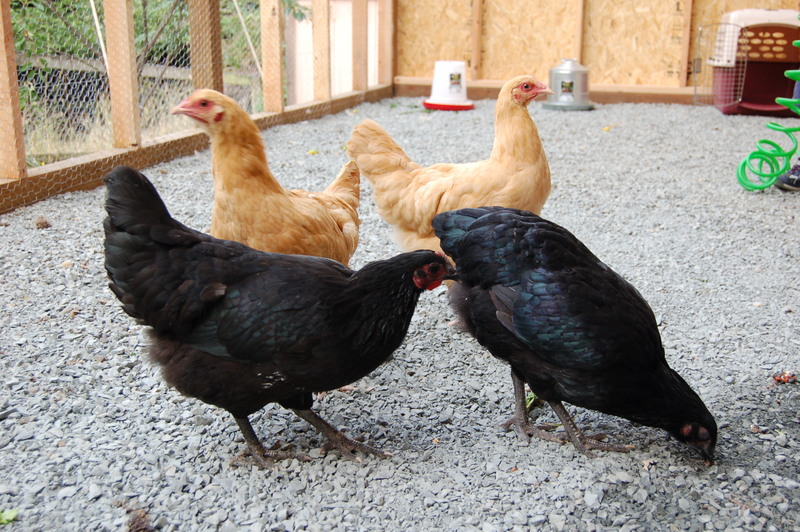 When I closed them into their coop that night, I think I closed one chicken out of the coop. We found a pile of feathers in our yard, so we know for sure it is gone. The lost chicken was one of our Buff Orpingtons, the one we named Blondie. So RIP Blondie. I hope you went quickly. In final chicken news, no eggs yet. The chickens are getting mild threats of heading to the stew pot if they don’t produce soon. These are empty threats, but it sure would be great to start getting some eggs from them. This entry was posted in Electricity usage, Natural gas usage and tagged chickens, electricity, energy efficiency, Energy usage, natural gas. Bookmark the permalink. You’ll have to teach the chickens to call out numbers at night so you don’t forget one again. Great job cutting electric. Mr Chiot’s and I are doing the same. It’s a bit more difficult for us since we both work from home in computer heavy jobs. But we have switched to more energy efficient models. We keep our house at 63 during the day and 56 at night. A bit cold for most folks, but if you have a pair of fleece pants and a fleece pullover with big wollen socks, it’s not bad at all! We have a small space heater, if we get too cold working during the day we plug that in for a few mintutes and that fixed the problem without warming up the whole house. 920kwhs is pretty high for september/october usage but it has more to do with family size, house size and or course using electricity to heat water. A 15% reduction is a really good accomplishment thought. We use an average of 620kwhs every month excluding June, July & August when we use about 900-1200kwhs due to a/c. We switched from an old electric stove to a nat gas one and greatly reduced our electric bill, about 15-20 dollars a month and it barely even moved the gas bill. We also use direct vent nat gas water heater & furnace that are in the 95% efficient range. This is a must living in the southern part of Canada unless you want whopping usage. We are starting to insulate the upstairs this year with 2 pound closed cell spray foam, the blue stuff. It gives you a r7 for ever inch of foam and will seal air tight so an additional vapor barrier is not needed. Aside from the fact that it is not the best product for the environment initially over time I think it is probably the best product. There is a soy based foam but I don’t think it is nearly as dense and exchanging soy oil for petro I’m guessing really doesn’t make it any more environmentally friendly. Kind of like exchanging gasoline fore ethanol. Dan, I agree that our numbers are still too high. Our house is about 2500 square feet and there are four of us. We are really good about keeping lights off and the lights we do use are all flourescent bulbs now. We’re going to keep chipping away and working on bringing the number down. For example, adding more insulation is in our immediate plans. So thanks for the insulation tips. Just need to get the new roof finished off first. Our future plans do include solar, starting with solar hot water heating, so we know we need to bring this down as much as possible so our solar investments won’t have to be too huge. Susy, I’m not letting the chickens out of their enclosed space now so they should be safer. I think they will be happy to get the extended run for sure! Sandy, I’d focus on the small victories for now and contine to strive for better habits. I know when we replaced our furnace and saw a 15% drop in gas usage, then a 30% drop with the attic insulation and new windows, we were quite pleased, despite the lack of $ savings. Every little bit helps. And sorry again about your loss. I’m sure you’ll get eggs soon. For a 2500 square foot house with four people you are actually doing really well. We are in a 1900 square foot house with two people. I was just watching a business program and they were interviewing a geothermal company, it was actually rather interesting. I was always under the impression that you needed a huge area for geothermal but he was saying they can install the pipes in a 10’x10′ area and can even run the pipes vertical via drilling. He said that many of his customers are adding the system ($16,000ish) to a 25-30 year mortgage and ended up with the equivalent of a $75 a month heating/cooling bill until the system is paid off. Here is the video link, it is at the 16:15 minute/sec mark. You have inspired me to get more serious about tracking the energy useage as a comparative to prior year periods. I do that periodically but have not been too serious about it. We made real progress in energy reduction two years ago. However, this past year I think we slid backwards a little bit. Time to redouble the efforts and see if we can reduce this down even further.